Britt Reid, like all great crime fighters, hid his identity-behind an alter-ego. As the Green Hornet, he was often a suspect in the very crimes he ultimately solved. He buzzed into homes across the country, promoting law and order, while staying just one step ahead of the law himself! Join him and his faithful sidekick Kato as they "hunt the biggest of all game, public enemies who try to destroy our America" in twenty nail-biting adventures - many of which are available here to the public for the first time since their original broadcast. Justice is about to be served. 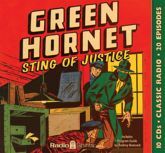 The racketeers are about to be routed, the underworld is about to go under, and the criminals are about to feel the sting of the Green Hornet! Includes a Program Guide by Rodney Bowcock!